After spending the summers enjoying the British roads on the 'Big Bikes', we decided to use our love of biking to raise some money for charity. After much deliberation we decided that it had to be a challenge situated abroad. We didn't want to do something along the lines of Lands End to John 'O' Groats in the fastest time possible. This is because we would become open to being accused of speeding or recklessness on the roads, this is not the image we wanted. We wanted a challenge; a test of navigation, fitness and stamina, and of course reliability on the bikes behalf will also be a big factor. So, after studying various maps and considering what would be a challenge. We have decided to go for a target of 16 countries in 4 days. We are planning to depart on the 9th March, this will enable us to be back before the 16th March, Red Nose Day. For information about the route and countries we will be visiting please take a look at our Route page. On Friday 9th March the day of departure had arrived. The magnitude of what we were undertaking had sunk in, and we were a bit nervous about the trip. There were a lot of last minute things to sort out, it was a challenge in itself to get out of the door and set off! All the usual feelings of 'Have we forgotten anything?' were going through our heads. We had all our gear packed, such as thermals from Sub-Zero. We had the bikes equipped with the new Garmin Zumo sat-nav and Interphone communication fitted to the Nitro flip-front helmets, which were very kindly sorted out for us by Motocomp. The bikes had been fully serviced and given the A-ok by Genspeed in York and Pendle Motorcycles in Nelson. All we had to do was get our paperwork sorted and arrive in time for the ferry. We got to Hull and checked in for the ferry and came across our first obstacle, there had been an admin error on the booking for the ferry and the ZZR wasn't booked in! The lady at check-in very kindly allowed us to board, and said she would sort out the problem and get our boarding pass to us on the ferry. 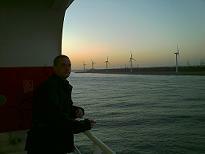 We got into Europoort around 0800hrs and set off on our journey around 0830hrs. At this early stage our spirits were high and we were confident that we could complete the challenge. Travelling south through Holland we followed the A15 motorway past Dordrecht and then Antwerpen. We followed the motorways as this was the quickest route to go, but travelling on motorways is hard on the riders' backs and knees. It is also extremely tedious, we got a great view of service stations along the way. One of main concerns was the effect that the motorway travelling was having on tyres. Motorways are extremely hard on motorcycle tyres and very quickly wear the centre of the tyre away, resulting in a 'Chicken Strip'. The Avon Storm STs that we were using were fantastic and showed no apparent wear. We were also able to break up the monotony of the motorway by talking to each other via the Interphone devices, for some reason Daz spent most of the trip through Holland and Belgium singing Whitesnake - Here I Go Again (rather badly). What we hadn't counted on however was the length of time it would take to refuel the bikes. Daz had originally purchased a ZZR but because of the problems he had with it he ended up travelling on a Suzuki Bandit 1200 and very quickly discovered its limited fuel range of about 100 miles. The ZZR could cover around 140 miles to a tank of fuel quite easily. The result was more frequent fuel stops and we very quickly became behind schedule. The Zumos helped us in this respect and saved us again at a later stage because of the very useful and accurate coverage of fuel stations that are already on the device. By around 1630hrs we got to Bussang and were 1 1/2hrs behind schedule, and still hadn't stopped for lunch. 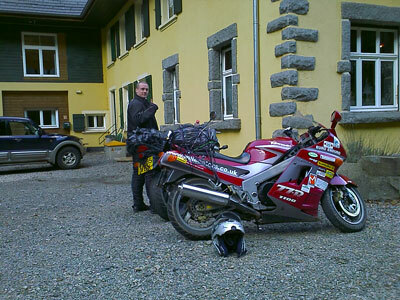 We found a 'Biker' hotel/caf� called MotoHotel du Col de Bussang (www.coldebussang.com) and had a well needed rest and bite to eat. After around 20mins we set off again, by this time we were over 2hrs behind schedule and Basel was an hour away. We were starting to get worried that we were going to fail our challenge, as we had nearly 60miles to travel on twisty mountain roads and we were unsure of how the apparently hard wearing tyres would perform. But the Avons excelled again on the twisty roads, our fears of them having compromised grip in the corners was unnecessary. 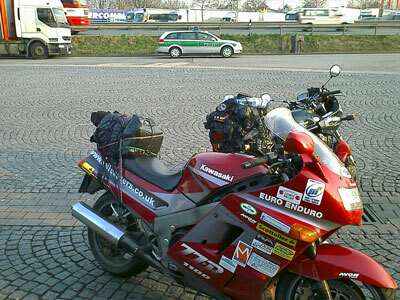 We arrived at Basel around 2-� hrs behind schedule and Daz's Bandit was running on fumes. We had to get fuel but had no idea where a fuel station was, the Zumo saved us and lead a coughing and spluttering Bandit to a fuel station, where she promptly died as she ran out of fuel on the forecourt! After refuelling, the Zumo lead us down a maze of streets in Basel and back on our way across Switzerland. As our journey across Switzerland was based entirely on motorways, it was extremely handy to be able to ignore Daz's singing and listen to MP3s on the Zumo instead. A great feature we thought. By the time we arrived in Lichtenstein it was about 2115hrs and about -5C with wind chill about -15C!! Even in these temperatures the Ryan Matthew textiles and Sub-Zero thermal clothing performed fantastically. We didn't even suffer cold feet! To give you an idea of how cold it was, when we went across the border into Austria, the border guard didn't even bother checking us. Guess he didn't want to leave his warm office! On arriving in Landeck at Hotel Enzian ( www.hotel-enzian.com ) we were immediately welcomed and shown to our room to shower and change. As soon as we got downstairs, we were treated to a beautiful Austrian 3 course meal and a beer. We also found out a bit about the hotel, while we were there we were surrounded by skiers, and found out that the Hotel Enzian is a ski lodge in winter. But in the summer they run motorbike tours around the Alps, and you can take your pick from a number of different bikes to ride including the big BMWs, and even ride a different bike each day you are there. After a hard days ride you can relax in their sauna, unfortunately as it was 2230hrs when we arrived, we only managed to relax for about 20mins. But we would definitely recommend a trip to this hotel, we will go back, but for at least a week. On the second day of this trip, we ached. Getting back on the bikes was not a prospect that we were looking forward to. We enjoyed a pleasant breakfast and were asked if it was ok to take some pictures of us and our bikes. 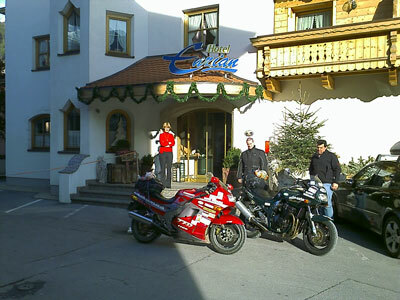 We were the first bikers to visit the Hotel Enzian this year, all the other guests were skiers. We had a brief, but lovely stay at this hotel and were even given a packed lunch by the owner's wife. Our first job after leaving the hotel was to refuel, and then make our way to the A12 motorway towards Innsbruck. At Imst we had planned to follow a pass over the mountains and into Italy arriving at Vipiteno just north of Bressanone. We ignored the Zumos' instructions to turn around and followed the pass up into the mountains, we were travelling up some beautiful roads that any biker would dream of riding up, and passing scenery that belonged on a postcard. Daz was in his element on the Bandit on these hair-pin adorned roads and I was having fun on the ZZR but soon realised that the size and weight of the Kawasaki made it exhausting to throw the bike into the bends. We were both extremely impressed with Avon's Storms and we never felt like the tyres were short of grip. As we started to rise above 1500meters asl we discovered snow, a lot of snow. Two motorcycles travelling up a snow covered mountain got an awful lot of looks from the skiers going down the slopes near the road. At around 2000meters asl we discovered that Avon's finest double as snow tyres. Although I did get stuck once, much to Daz's amusement. Why do we always laugh at another's misfortune? At 2171meters asl we came across a slight obstacle, a barrier and a helicopter on the road. After quizzing a skier about why there was a helicopter parked on the road. He very kindly informed us that we were crazy riding motorbikes in the snow and that the road was closed and re-opened in June! We had a quick discussion and decided that waiting for the road to re-open would definitely put us behind schedule, we put our trust back in the Zumo as it lead us the 50miles back to Imst. Daz was really quite excited as I listened to him sing Here I Go Again on the way back down the pass. The combination of a Bandit and great tyres made Daz's journey back down a pleasure. However I was riding a ZZR, weighing in at nearly 250kg, nearly 4 times heavier than me, and a definite handful on snow and tight bends! It was still a fun ride back, although exhausting. By the time we got back to Imst it was 1200hrs and we were approx 20miles from Landeck! So we were already 3hrs behind schedule, and had to refuel and eat. By this time we should have been out of Austria and into Slovenia after visiting Italy, around 200miles down the road, not 20miles from the hotel. We had some serious riding to do, for the second day running we had underestimated how hard our challenge was and how easily we could fall behind. We got back on our bikes and followed the route on the Zumo into Italy and eventually got to Vipiteno, unfortunately we missed a turn off, guess we were just fed up and not paying attention to the Zumo. We ended up turning round and parking in an entrance to an old vinery. We had to have a break, we couldn't believe how badly the trip was going, we were over 3hrs and nearly 300miles behind schedule. 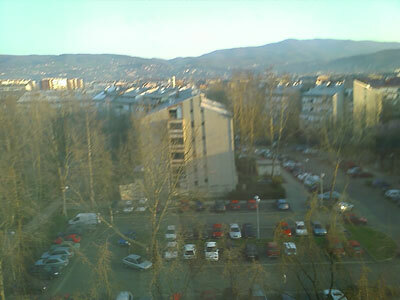 Zagreb - From hotel window. We found a lovely little hotel in the Dolomite Mountains and had a proper cup of Italian espresso to help us regain our composure and determination. We couldn't afford to fail. With the added motivation of a caffeine hit we carried on. Another refuelling was in order, but unfortunately everything in Italy is shut on a Sunday. We found an un-manned petrol station on the way to Sillian. After spending 10mins trying to work out how to get fuel to no avail, we succumbed and asked another customer how to work the pumps. After entertaining a local with our inability to do a simple task such as getting fuel from a petrol pump, we carried on our journey. 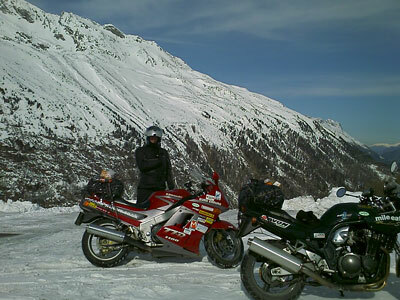 We passed back over the border into Austria and down the Sillian Pass. By the time we got to Villach it was nearly 1900hrs and we were officially 7hrs behind schedule. We had reached a point of desperation, I texted my girlfriend. We decided that we had to push on, but there was no way we could catch up and make it to Nagykanizsa. We made the decision that we had to get to Zagreb. At around 2020hrs we got to Ljubljana, and I phoned my girlfriend Lizzie and asked her to find us a hotel in Zagreb with secure parking for the bikes. The bikes security was our priority, without them the challenge was over. Lizzie found a hotel called Antunovic, but it was 84miles from where we were, and it was 2030hrs and dark! So we had a coffee and a burger. After our beef and caffeine hit, we had over an hour of night riding and a border to cross. We certainly raised a few eyebrows crossing into Croatia, why were two English bikers crossing the Croatian border at 2215hrs? At around 2230hrs we got to the second hotel and parked up the bikes. By the time we got the bikes sorted and into the room it was nearly 2300hrs, time for a beer and sleep. This was our second day of riding for 14hrs, we were physically and mentally exhausted. Surely we couldn't have more days like this, we ached in places we didn't know existed, and we stank! Our third day started at around 0530hrs, a quick shower to try ease the smell and then get some breakfast. After a mug of coffee that was the same consistency as bitumen and enough caffeine to make a sloth hyper, we were ready to hit the road by around 0830hrs. We were still 100miles behind schedule and had to get across Zagreb in rush hour traffic. Riding through Zagreb was a nightmare, self-preservation has never before been such an important concern. The Interphones proved to be a godsend here, it was fantastic and a lifesaver being able to talk to each other and tell each other where the other person was. But not only that, it also enabled us to watch each others backs while trying to avoid any contact with the competitors in the daily 'Whacky Races' across town. Eventually we got out of Zagreb and onto the motorway towards Hungary. After crossing the border into Hungary, for some reason we seemed to hit swarms of insects. So after eventually reaching Nagykanizsa and refuelling, we had to remove the corpses from our visors. After checking the route across Hungary we decided that the way to go was on the E65. This is a trunk road. There is a motorway but it is a toll road and it would take us on a 200mile detour via Budapest. The result of the motorway being a toll road is that all the wagons use the E65 as well. The road surface was therefore not ideal for motorcycles and was very similar to sliding down stairs on your backside. Needless to say, crossing a country on roads like this certainly tested the durability of our bikes and equipment, and was more interesting than sitting on a motorway. At least the scenery was nice. We saw some absolutely beautiful old buildings including an old church. One sight that made us both feel humble, was two men who appeared to be attempting to cultivate a 10 acre field using a spade and a hoe! We thought we had a challenge! After crossing a rather bumpy Hungary we arrived in Slovakia about 3 1/4hrs behind schedule and 2 inches shorter due to hammering our spines had received! We thought this was quite an achievement considering that at Zagreb we were nearly 8hrs behind schedule. After crossing the Hungarian/Slovakian border we were accompanied by another Bandit 1200, who decided to overtake and show off his local knowledge of the roads. We couldn't let the side down and admit defeat, so we showed him how the Brits can ride. He passed us again in Bratislava while we were fuelling up. 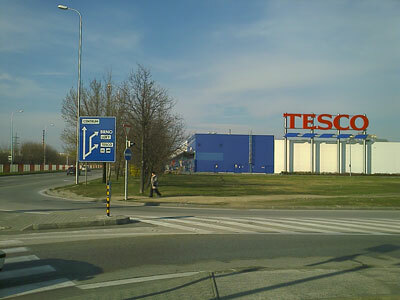 One of the first sights we saw in Bratislava was a sign for the centre of Bratislava, Brno and Tesco! We had around 300miles to get to Bogatynia in Poland, none of this mileage would be on motorways as we wanted to avoid the tolls. Obviously this was going to a hard ride. Continuing north out of Bratislava, we headed for Brno. Thanks to the Zumo we could ignore the signs for Brno, which were all sending us down the toll motorway, and followed the E65 out of Slovakia and into the Czech Republic. While we were at the coffee house in the Dolomites we had been told that the Czech republic was operating a vignette system for their motorways. This news was not good, as obviously it would mean more costs. However when we got to the border of the Czech Republic, we got some good news for a change. We were informed that motorcycles were exempt from vignettes. This was a godsend we thought, as it meant we had a chance of making up time. Unfortunately the motorways in the Czech Rep are not exactly smooth, this slowed us down. Even worse for us was the amount of traffic to the south of Brno due to road works, nothing worse to cause a delay than rush hour and road works. 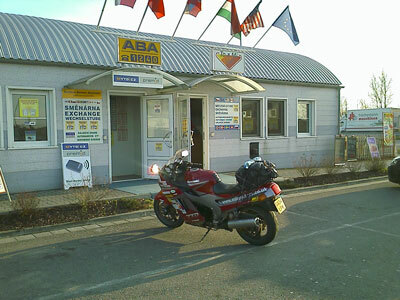 We got onto the ring road around Brno and fuelled up, by this time it was 1730hrs. To get back on schedule we had 200miles to do, but we now had to come off the motorway and head north to avoid Prague. We couldn't chance the risk of delays due to traffic and felt we would be better on the minor roads. It was beginning to get dark and we were being lead up a maze of back roads, the Zumo was giving us an eta of 2200hrs in Bogatynia. This wasn't good, north of Liberec was a ski region, the prospect of twisty mountain roads in the dark was daunting, but with the added risk of snow and ice due to the rapidly dropping temperature, we were very apprehensive. At around 2100hrs we refuelled about 30miles south of Liberec, because of the roads we were averaging around 30mph, this meant that we would arrive in Bogatynia 50miles away at nearly 2300hrs. We had no choice but to make the decision to stay in Liberec, and try make up the distance in the morning. Arriving in Liberec at nearly 2200hrs, we had to find a hotel. Again the security of the bikes was the first priority. 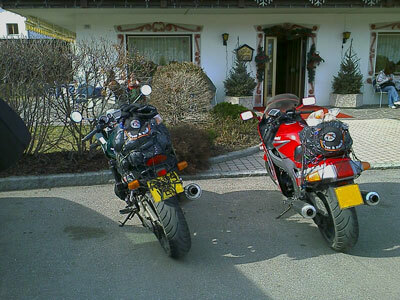 After riding round Liberec to find a hotel for about � an hour we found a hotel that would allow two bikers to stay. They had a locked compound to leave the bikes in, this wasn't ideal but we were out of options. Due to the temperature we were a little concerned about whether the bikes would start in the morning, they had been garaged at the other hotels on the trip and protected from the cold. Food was also high on priorities, but at 2230hrs everything was closed except for McDonalds! Apparently a Big Mac is still a Big Mac in Czech Rep. But we didn't fancy the resulting toilet stops on the last day, so we gave McDonalds a miss, and settled for a bag of crisps and a beer for our dinner. When we got into the room, we were shocked, the d�cor in the hotel looked like it was last replaced in 1960! Daz asked if I had seen the film Hostel (Hostel follows three backpackers in search of easy thrills in Europe, who are lured to an obscure hostel and become victims of a secret thrill-kill industry. Although the film is set in Slovakia, the town in the film is actually Cesk� Krumlov, a very popular tourist destination in the Czech Republic). We slept with the doors locked and one eye open! After a fairly restless night we were up again at 0530hrs, had a quick shower and got some breakfast. It was quite unnerving sitting in the restaurant having breakfast surrounded by dead animals mounted around the wall. At least they weren't the other guests, bearing in mind Daz's comment the previous night about the film Hostel! By about 0745 we were packing the bikes ready for the final day. Even though the bikes had been left in freezing temperatures all night, they started on the button. According to the Zumo, we should arrive in Bogatynia in approx 30mins. We had a slight delay on the Czech/ Poland border, think the guard found it suspicious to see two English bikers crossing into Poland at about 0830hrs on a back road! We probably doubled his daily traffic! As we got into Bogatynia we saw the hotel we had planned to stay in and a sign for Tesco! We had to get a picture of the bikes here. Idea for another challenge, 16 Tesco's in 4 Days anyone? Wouldn't be that hard, we saw signs in Bratislava for 4 of them! Heading north through Poland from Bogatynia toward Gorlitz on the border, we realised that we still had over 650miles to travel, but today we didn't have the luxury of being able to keep riding till 2200hrs. We had to be at the ferry at 1930hrs. We crossed the border into Germany at around 1030hrs, with 620miles to go, we had to have an average speed of nearly 80mph to make the ferry. Your first assumption that this would be easy on the German autobahns would be wrong. Don't forget, we had to cover 620miles, in 9hrs, including fuel stops. The Zumo had our eta as 1730, but this didn't include stops. We estimated that we would need 6 fuel stops to get to the ferry. An average fuel stop takes about 15mins, to fuel the bike and stretch our legs, this bumped our eta to 1900hrs. We breathed a sigh of relief, it would be tight. Unfortunately though, we then realised that traffic will be a problem. We had � hour leeway to get through the traffic around Dresden, Dortmund and Dusseldorf. We would be passing Dortmund and Dusseldorf at peak time, this was going to be another extremely hard day. Then we still had to get across Holland. We soldiered on, sustaining a good speed of around 95mph on the autobahns. I know this sounds fast by the UK's standards, but the only traffic we were overtaking were wagons and cars with trailers. At this speed we were able to maintain our average of refuelling every 100miles, and managed to keep on schedule on our journey across Germany. The delays really started as predicted when we arrived near Dortmund, the traffic became horrendous, and our eta had soon crept up to 1930hrs when we got into Holland. Just over the border in Holland we refuelled, at 1820 we had 99miles to go and 1hr and 10mins to get to the ferry. We had an incredibly hard last leg to do, 70mins to cover 99miles. The Bandit could just about manage 105miles to a tank if it's ridden sensibly but it can very easily empty itself in around 70miles when thrashed, so even the fuel would be tight. Crossing Holland was a nightmare, the traffic was horrendous. We had to make full use of our ability to communicate with each other, and watch each other's backs in the chaotic rush hour traffic. With 5miles to go, our eta had crept to 1940hrs and the thing I'd been dreading came over the Interphone. Daz needed fuel! Badly! We checked the Zumo for the nearest petrol station, but they were all off our route, except one that was about a mile down the road. This became our target, if Daz ran out of fuel that would have been a disaster. Imagine our horror when we found the petrol station, but it was on the other side of the dual carriageway! Due to our reduced speed to try conserving what little fuel Daz had, our eta had crept to 1945hrs. We still had 4miles to go, we had to carry on regardless. I knew that I had around 4-5 litres left in the ZZR, and was prepared to donate some of that to Daz's Bandit to get us to the ferry if the worst happened. How? As both our bikes are fitted with Scottoilers, I had taken some spare pipe with to enable us to patch them up if we needed to. This pipe would be used to siphon fuel out of my bike and transferred to the thirsty Bandit. As we pulled into the ferry port, the Bandit started coughing and spluttering. We both pleaded with the Bandit to keep running, even though she was empty and spluttering she somehow kept running, and we got to the first check-in point and Daz killed the engine to save fuel. We sorted our boarding passes, and were told to board quickly, we had arrived late, had we been 5-10mins later we wouldn't have been allowed to board. Damn, it was close! Daz started the Bandit and she spluttered and died, with about 200yrds to go. We again resorted to pleading and coaxing the poor Bandit, and cranked her over again. She started, but was not happy and limped away from check-in. She had just covered nearly 2500miles in just 4 days, and here we were starving her of fuel but she must have been as determined as we were, because she made it onto the ferry and died as Daz parked her up. What a bike! We would worry about fuel in the morning when we got back to Hull. First job was to get changed and get some food, we had done it! We celebrated with a good meal and a beer. We were elated, we had just completed our challenge, with just 5 mins to spare. After we had eaten we relaxed in the lounge on the ferry, we were exhausted and our bodies ached in places we didn't know existed. There was a pianist playing in the lounge, imagine our horror when he started playing 'The Heart Will Go On'! There we were sat on a ferry listening to the theme tune for Titanic! We decided to call the celebrations short and get some rest, we were absolutely exhausted! We arrived back in Hull, unfortunately sometime in the morning between getting a coffee and packing to get off the ferry Daz lost his camera. We were devastated, it had a lot of pictures from the trip on it. 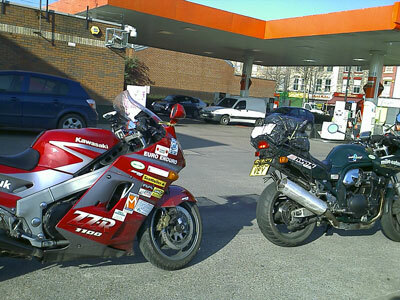 We also had the Bandit's fuel situation to worry about, siphoning fuel from the ZZR was still an option. The bikes were packed and then we started them. The Bandit sprang to life even though she must have been empty. We limped across Hull to the nearest petrol station, the poor Bandit needed 14.3litres to fill the 14.5litre tank (We didn't use the reserve, as this was being saved for a last resort). Bless the old girl. 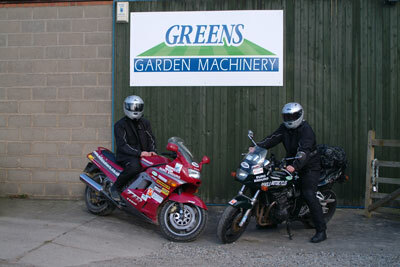 We left Hull and headed back to our start point at Green's Garden Machinery in Easingwold. On the way we called in at Minster FM, as they wanted to know how the trip had gone. Before the trip, we had set ourselves a very tight schedule. The fact we had no mechanical failures really is a testament to the quality of workmanship by Pendle Motorcycles and Genspeed Racing, as both the bikes cost less than �2000 each. Pendle Motorcycles worked on Daz's 9 year old Bandit and Genspeed worked on my 17 year old ZZR. They were both fully serviced and consumable parts replaced. Thanks to the support from Scottoiler both bikes were fitted with them. Haynes manuals say that you should adjust your chain every 5-600miles, we did 2500miles and didn't have to adjust them once, and they still don't. That really is the result of a fantastic product, definitely a must have on any chain driven motorbike. Ryan Matthews supplied us with boots, gloves and textiles, we nearly lived in the gear for 4 days. We found them lightweight, warm and extremely comfortable even as the temperatures rose. We don't know about the level of crash protection they offer, thankfully! But they do use KNOX armour, so they should offer better protection than competitors that use foam pads instead. Would recommend them to anyone looking for textile riding gear. The Interphone, Garmin Zumo and flip-front Nitro helmets were supplied by Motocomp. All three performed fantastically and proved to be a fantastic asset on journey of this type. The Interphone is great as a bike-to-bike com set-up, but also excels when used in conjunction with the Zumo, for navigation or MP3's. The helmets proved extremely useful when crossing borders and paying at petrol stations, we didn't have to mess about removing them each time, as I wear glasses removing helmets is a nightmare. With the pin-lock visors in place we had no problems with our visors misting up, even in the extreme temperatures we rode in. The Zumos were fantastic, as a bike navigation system they are feature packed and extremely easy to use. The user interface takes a bit of getting used to, but after about 1/2hour playing with them you soon get to grips and they make perfect sense. The database of petrol stations is a lifesaver and could save you a long walk pushing a motorbike if used in conjunction with the fuel gauge feature. The fact that you can transfer them from your bike to the car in a few seconds is the icing on the cake. They also have an off-road option for all the green laners and trail riders out there. A four hour battery life makes them a good companion for hikers as well. Avon provided us with their new Storm ST's, when we saw how they performed on the motorways we were a little dubious as to how they would cope on the tight twisty Alpine roads, but our fears were quickly dissipated when we got into the first corner. In cold temperatures they heated up extremely quickly, and maintained grip on freezing roads. They were extremely sure footed and never short of grip under acceleration, cornering or braking, even with the weight and power of the Bandit and ZZR. After 3000miles of riding before, during and after the trip, they are still only about half worn. When you consider the amount of motorway riding we did, this is a fantastic achievement of Avon to create a tyre of this quality. Our thermals were supplied by Sub-Zero, and kept us warm in temperatures that would send most bikers running for their car keys. After using them in temperatures ranging from -5C to about 20C we found that they kept you warm in the cold but surprisingly cool when the temperature rose. Again they are incredibly lightweight, comfortable and thin enough to wear under your normal riding gear, either textiles or leathers. We would like to say a big thank you to all our supporters and to the companies who donated these products. Everything stood up to this challenge, which is testiment to their quality and reliability. Also a special thank you to Jon at Pendle Motorcycles and Gary at Genspeed Racing for their time and expertise used in preparing the bikes. If these guys weren't so good at their jobs, we couldn't have done it. And finally a great big thank you to everyone who sponsored us and helped us raise money for Comic Relief.